The argentinian Boa has a dark-brown to black shade, which is in contrast to the bright scales that build the boa pattern. This boa can reach a length of ten feet and more in captivity too. 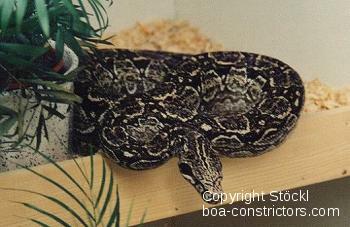 Not all Boa c. occidentalis look attractive. Black specimens with a high rate of white, and a distinctive contrast are a treat for the eyes. Incidentally, in our experience the Argentinean boa is fundamentally more active than the other subspecies of Boa constrictor. The Argentine boa is the only one subspecies of Boa constrictor that is registered in the appendix I of the CITES. That means, that it is threatened by extinction. Therefore, a special permit is needed for commercialization. Almost 80 per cent of the Argentine rainforest has been cut down during the past 90 years. In 2002 only 330.000 Square kilometers (127.414 Square miles) of initial 1.060.000 Square kilometers (409.268 Square miles) in 1914 still exist, according to a study that was recently published by the Argentine Authority of Environment in Buenos Aires. The loss equals more than the double size of Germany. The reasons are the expansion of agriculture and cattle breeding as well as the deforestation by the timber industry, according to the study. 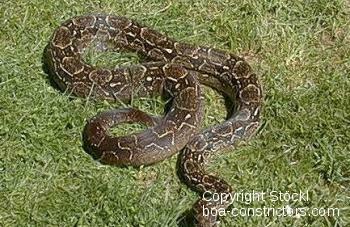 Therefore it is no wondor that the Argentine Boas is in immediate danger of extinction. Considering the dimensions of this veritable ecocide, it appears more than justified that the Argentine boa has been included into Appendix I of the CITES convention to warrant its strict protection. Obligatory marking is a side effect of this status. It can be affected by the implantation of a transponder (‘chipping’) or by photographic documentation. This procedure is certainly well-meant, and it has proven its worth in most other endangered animals, but as far as Boa c. occidentalis is concerned, its consequences have turned out to be rather counterproductive. 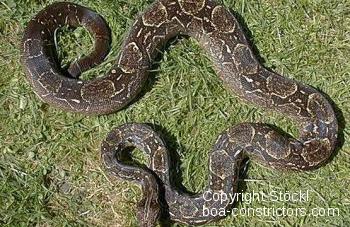 Until the late 1990s, the Argentine boa has been bred quite frequently both in Europe and in the USA. Its private husbandry thus did not give the slightest indication that this species was endangered. This situation abruptly changed in Europe when obligatory marking was introduced on 1st January 2001 as the repercussions of this measure on the breeders’ motivation are far from positive. If such a keeper is made happy with a litter of - let us say twenty - young by one of his female Boa c. occidentalis, he has no alternative but to keep all of them separately - a ‘blessing’ due to obligatory marking. Otherwise, it would be rather difficult to assign the respective CITES documents accompanied by a photo if one of the animals happens to be sold. A propos photos: They must show specific characteristics of the illustrated animals if they are to meet the requests of the authorities. As a consequence, photographic documentation frequently develops into a torture - both for keepers and baby snakes. As matters stand, it is not surprising that most breeders of Boa c. occidentalis were soon fed up and turned themselves to other subspecies which did not require obligatory marking. Consequently, Argentine boas have become a scarce commodity again, and some lovers of Boa constrictor are looking despairingly, and without success, for this variety once again. In this way, obligatory marking has turned out to be counterproductive. Therefore, the old saying applies: Well-meant measures are often far from being well-considered.